Are you the type of person who would dream of littering, exploiting endangered species, offending your environment and natural heritage, or the type of person who simply enjoy the breathtaking and take pictures of the different extra-ordinary rock formations, or just enjoy being in the wilderness that will momentarily take you away from the buzz ling life of the city? 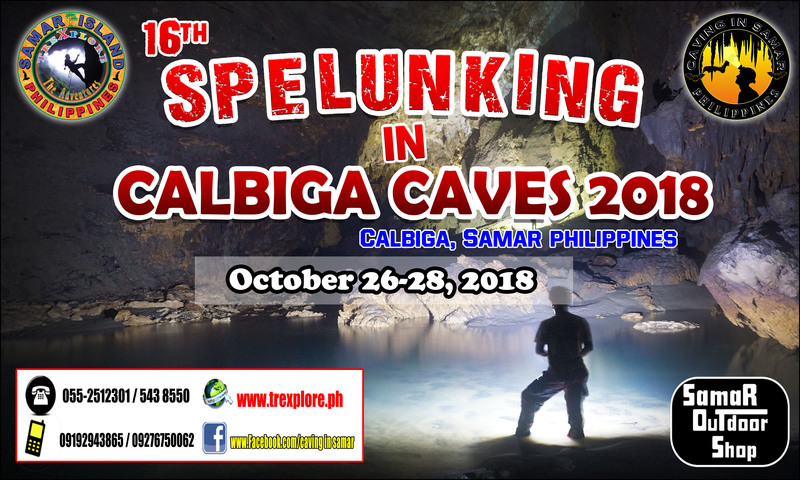 Why not join the 16TH SPELUNKING IN CALBIGA CAVES 2018 organized by the Trexplore The Adventures featuring the country’s biggest cave, the Langun Gobingob Caves in Calbiga, Samar to be held on OCTOBER 26-28, 2018 (FRIDAY- SUNDAY). Our goal is to promote the great potential of Samar caves in the eco-tourism industry and at the same time, boost awareness in our drive to conserve and protect its archaeological importance. Maximum of 30 participants will be accepted nationwide on a first come, first served basis of discipline mountaineers, cavers, and environmentalist which will include young professionals, nature lovers, teachers, students, private and government employees. For RESERVATION. Please inform the Secretariat by mail or by telephone for your confirmation. You can also call or text at (Smart) 09192943865 (Globe) 09276750062 (Bayan Tel) 055-2512301 (Globe) 5438550 or email us at cavinginsamar@yahoo.com & samar@trexplore.ph. Transportation within Calbiga,Entrance Fee, Mayor’s Permit,DENR/ SINP Permit, Caving Certificates & Pictures/ Videos will be save in your USB or Memory card Local Guide and Trexplore Cave Master Guide, Photo Documentation. 12:00 NN Lunch in Rutchel Native Chicken tinola.